The Yellow-faced Parrotlet (Forpus xanthops) is endemic to dry woodland, riparian thickets and scrub in the Marañón Valley in north-western Peru. It is treatened by habitat loss and trapping for the wild bird trade. The trapping caused a rapid population decline in the 1980s, but following a ban, the numbers appear to have stabilized. Still, less than 1000 individuals are remaining in the wild. 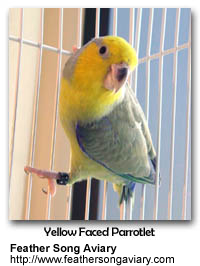 The Yellow-faced Parrotlet averages 14.5 cm (6 in) in length. The male has a yellow crown, with this coloration extending over the cheeks and throat, becoming yellowish green over the underparts. The occiput and nape are bluish green, with the upper back and wings being greenish gray. The lower back and rump are cobalt-blue, as are the upper tail coverts. Both primary and secondary coverts (please refer to Wing Anatomy) are violet-blue, of a paler shade in the case of the secondary coverts. The innermost primaries are suffused with blue at their bases, while the inner secondaries (shorter, upper "arm" feathers) are violet-blue. The lower surface of the flight feathers are bluish green, with the under wing-coverts being dark blue. The tail feathers are green on their upper surface, and dusky below. The beak is greyish horn in color, darker along the culmen from the base. The legs are pinkish and the irises are dark brown. Hens are duller in coloration, with the lower back and rump being pale blue. The under wing-coverts (please refer to Wing Anatomy) are predominantly gray, with a slight blue suffusion. In addition, both the primary and secondary coverts are greenish with a blue tinge, as are the secondaries (shorter, upper "arm" feathers) and bases of the primaries. They are able to learn to talk and share the "big parrot" attitude of the lovebirds. They can get nippy, and require training. They are not very noisy, about the same noise level of a cockatiel. 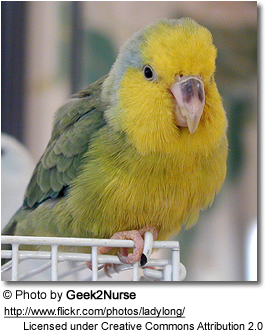 Parrotlets can be nippy, as they do discover their beaks as method of "disciplining us" once they are out of the "baby stage" and they can generally be somewhat naughty, and it really is important to learn to understand them and to guide their behavior before an undesirable behavior has been established. Even a young bird that has not been neglected and abused requires proper guidance; this becomes even more challenging when it involves a rescued bird that may require rehabilitation. Spraying them with a mister bottle helps in curtailing any negative behavior; however, continuous guidance is important.